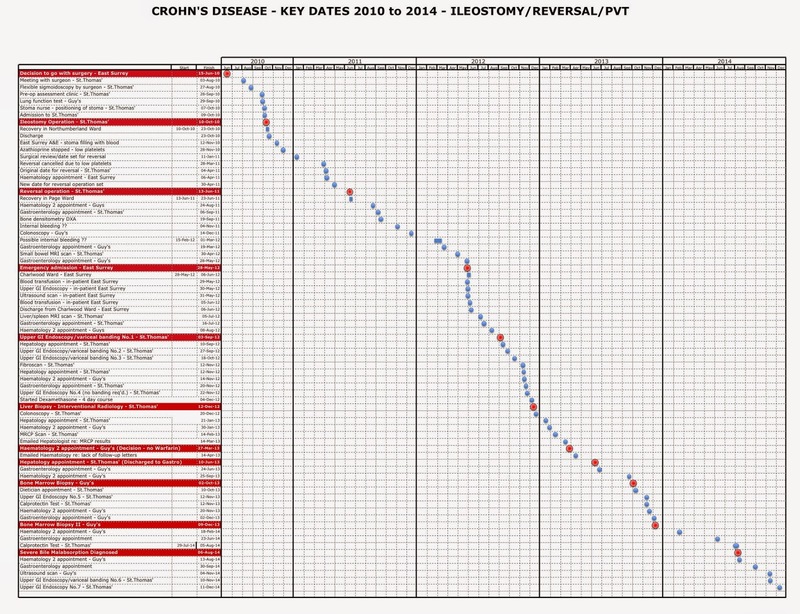 Apart from the physical and psychological effects of Crohn's Disease there's one aspect that I don't see mentioned that often - the huge amount of time that patients can spend attending appointments and undergoing tests or procedures. Just how disruptive this can be was brought home to me after my ileal re-section in October 2010. The diagram below demonstrates the issue. I can still clearly remember this test at Mayday Hospital as if it was yesterday. As with any of the procedures there was the prep to take the day before which effectively emptied my digestive system. I arrived at hospital and changed into one of those backless gowns that are impossible to fasten properly without help. It was then back to the waiting area. Just putting on the gown already lifts the stress levels and sitting like that in a waiting area just makes it worse. The first problem was swallowing the barium meal - a thick, off-putting, tasteless sludge. Having downed the final mouthful there was then a wait whilst it made it way slowly round my digestive system. I was taken to a bed and told to lay on my right hand side for 45 minutes as this would aid digestion. When the time was up I was shown into the x-ray room. As a result my consultant gave me the choice of starting Azathioprine or having surgery. Even though it was 20 years since my last stay in hospital I really didn't fancy another one. There were other factors such as our lifestyle. A major operation and the associated recovery period would have put a stop to all our plans, so I chose the drug route. I haven't had one of these for a long, long time. I thought they had probably been phased out by the introduction of CT and MRI scans but I asked the question on the CCUK Facebook page in August 2014 and several people confirmed that they are still used. Of all the procedures I've been through I think this is the most undignified. Having taken the usual purging prep the previous day, arrived at the hospital and changed into a gown, I ended up on a bed with a tube stuck where the sun don't shine and barium liquid being poured down it. Once I was "full" the instruction came "to try and to hold it all in" whilst the tube was removed and the x-rays taken. Just writing this I am clenching my buttocks as I remember that feeling of the tube being gently withdrawn and then it's all down to muscle control. Once the x-rays were done, there was the dash to the nearest bathroom to allow what went in to come out, rapidly. I think I'd sum up the whole experience as unpleasant and the most likely to end in a very messy situation involving embarrassment, mops, buckets and cleaners. The procedure was planned for 3:00pm so I went into work as normal. In the morning I had told various colleagues that I wouldn't be around after lunch and explained why. Every single one of them uttered the same 3 words "that sounds painful". After you've heard it for the umpteenth time a few nagging doubts set in. The previous week I had asked the haematologist if it hurtto which she replied "you've got Crohn's and had surgerys. You've dealt with pain! This will be nothing by comparison"
I checked in to the clinic and waited to be called. A nurse came over and gave me an identification wristband as the procedure would be carried out in the Day Hospital section. She said that I shouldn't have to wait too long. The aim is to get a liquid sample that can then be spread onto microscope slides for an initial examination within the department. 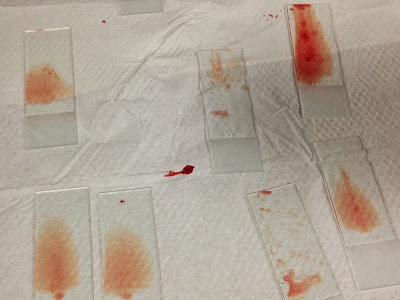 She was having problems getting a good sample that wasn't contaminated with blood as it kept clotting (which goes against what you would expect from low platelets). Because I was tolerating the needle so well she took some more samples but explained that the as long as she could get a good core sample then the quality of the liquid samples wasn't important. Time for the coring needle, which is quite a bit larger than the previous one. If you've ever seen one of those food programmes about cheese no doubt there will have been a scene where the cheese-maker inserts a tool into the cheese and pulls out a nice sample. Same principle here! CALPROTECTIN - I've only kept this one in for completeness. 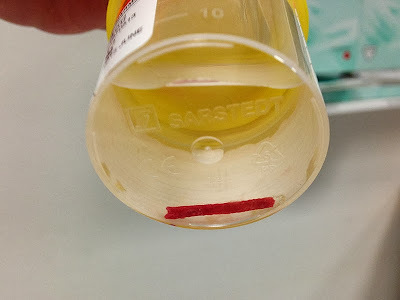 The procedure is very simple - collect stool sample; take to path lab; wait 10 days for result. Research has shown there is a good correlation between the calprotectin result and what would be seen by a colonoscopy. Preparation Day - Tuesday 19th June 2012 No eating after a light breakfast. At noon you drink 50ml of senna pod liquid. This is followed an hour later by a sachet of sodium picosulphate dissolved in 150ml of water and then again at 5:00pm. The camera has to have a clear view of the gut wall so you can guess the effect of these drinks. Once you've started drinking these liquids you don't stray far from the house. 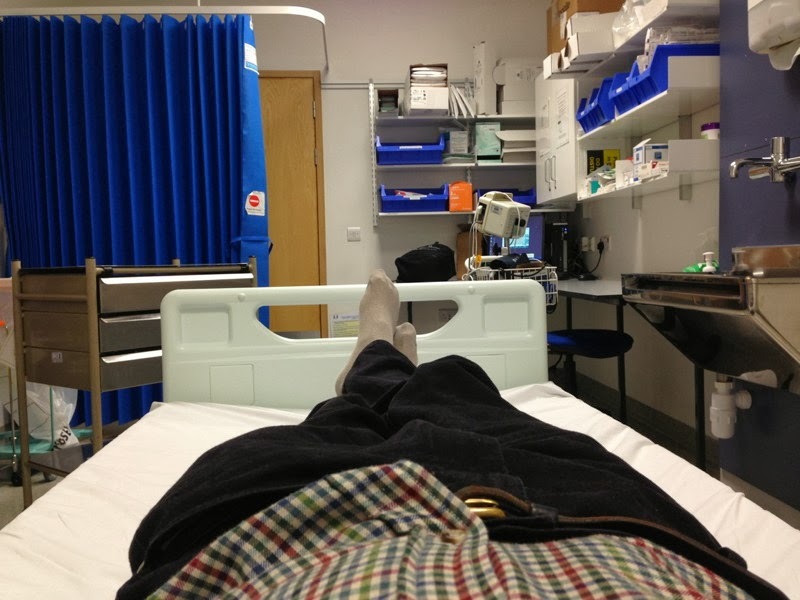 Procedure Day - Wednesday 20th June 2012 - the day of the colonoscopy. Having not eaten anything since yesterday morning at 8:00am the hunger got really bad. I was allowed to drink water up to 3 hours before the procedure. Got up to Guy's Hospital nice and early for the 1:30pm start time. I was accompanied by my wife as they will not carry out the test unless you have someone to see you home safely. By 1:40pm I was changed into a surgical gown ready to go. My blood pressure was then checked and I was asked questions on allergies etc. I was taken to a waiting area and was there about 30 minutes when I moved on to a corner of the recovery room where I had a canula inserted into the back of my hand and then I waited some more. At 2:30pm I was told that an in-patient was going in in front of me but only for a 5 or 10 minute procedure. Finally at 3:00pm the doctor came and sat down to talk through what he was about to do and get me to sign the consent letter, then we were off to the procedure room. I asked to have minimum sedation as I like to watch the camera images on the screen. Before starting with the camera he asked me various questions about my medical history and the medications used. I told that the MRI scan at the end of April suggested that the Crohn's had flared up again in both my large and small bowels and that the colonoscopy was expected to confirm this. He then explained the potential risks of the procedure, the main one being the risk of perforating the intestine and requiring surgery to correct it. I signed the consent form and we were ready to go. I explained that I wanted to be conscious so I could watch the monitor and was only given a mild sedative. I was told to lay on my left hand side, with my knees drawn up, and the camera was stuck where the sun don't shine. It all started OK but there was no sign of any inflammation. A real surprise. The camera continued on its way but then reached the sharp bend where the colon turns to run horizontally across the body. Try as he might the doctor could not get the camera to go round the corner. He tried withdrawing it a little and then pushing again. He then got the nurse to push hard against my abdomen to try and ensure everything was lying flat. He tried getting me to lie on my back. Nothing worked. There's never been a problem in the past so I don't know what went wrong this time. The "camera experience" lasted about 50 minutes. The amazing thing is that, so far, I haven't been able to feel any after effects. I was hoping that the lead consultant was the one carrying out the test as it would give me the opportunity to discuss the way forward with both the Crohn's and the new problem, bit I didn't see him. It looks like I will need to have the colonoscopy repeated by with another, smaller camera. There is a test that can be done on a "sample", called a calprotectin test , which gives a good indication as to whether Crohn's is active or not. Maybe they will opt for this rather than another camera job. The other alternative is a capsule endoscopy where you swallow a small capsule camera that transmits pictures of your digestive system as it passes through. The pictures are picked up, wirelessly, on a receiver worn around your waist. The day before the procedure and this is when the serious "prep" starts. You're allowed a light breakfast then only liquids such as fruit squash and Bovril. At midday there are 4 senna tablets to swallow. 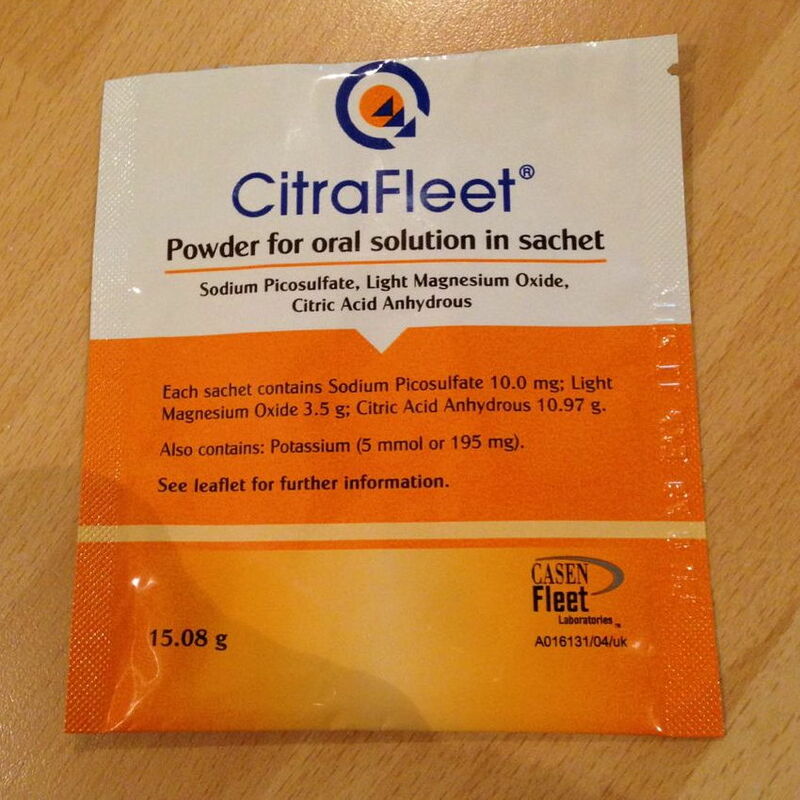 At 1 o'clock it the first sachet of Citrafleet (sodium picosulfate) mixed with 150ml of water. It doesn't taste that bad and quickly takes "effect". That's the "effect" that stops you from straying very far from the toilet! When it gets to 5 o'clock it's time to take the second sachet and that's it. Thursday 20th December 2012 - Procedure Day. An early start to get to Guy's Hospital for 8:30am. My train was a little late so I checked in just after half past and sat in the waiting area. About 10 minutes later one of the nurses asked if anyone was waiting to have a colonoscopy and 3 of us raised our hands. The other 2 had 8:00am appointments so they were seen first. At 9:00am I was taken into the changing area and given a hospital gown to change into. Then the obligatory questions - "are you allergic to anything?" "what tablets do you take?" etc.etc. I then went and sat in the recovery area and finally went into the ward to be fitted with a cannula. By now it was just gone 9:30am. I was pleased to see the friendly face of my lead consultant appear. He had asked me to ensure that I booked a slot when he was in clinic as he wanted to carry out the procedure personally and it had worked. He ran through the potential risks and got me to sign the consent form. We discussed what had happened during the previous colonoscopy in July and the fact that it wouldn't go round one of the bends. The other thing I mentioned were the side effects of the dexamthasone that I had been on to try and boost my platelet count. I told him about the hiccups and the change of personality. He hadn't heard of hiccups being a side effect but the mood swings were a well known effect of steroids. He remembered one patient who had been started on a high dose of prednisolone and the next morning had climbed under her bed and refused to come out! It wouldn't be long before I would be lead into theatre. Actually it was another 30 minutes, in which time I was canullated. I think the delay must have been due to complications with the previous patient as I recognised her as the one who was being seen just before me and she had certainly spent a long time in theatre. At last I was on. I walked into the theatre and lay on the table. The oxygen supply, heart monitor and blood pressure armband were all fitted and I was asked to roll onto my side wuth my knees drawn up. The doctor injected doses of Fentanyl (a powerful synthetic opiate analgesic similar to but more potent than morphine), Midazolam (a water-soluble, short-acting benzodiazepine central nervous system depressant and Buscopan (a medicine which is used to relieve spasms of the gastrointestinal tract). You'd think that this cocktail of drugs would knock you out but no, you remain fully conscious. You do have to be escorted home and are not allowed to drive. I was asked if I wanted to keep my glasses on and I said "Yes" so that I could watch the action of the monitor. Sharp intake of breath and the camera started it bendy journey. It made slow progress but by careful guidance, and some shifting of my position, it made it beyond the bend OK. 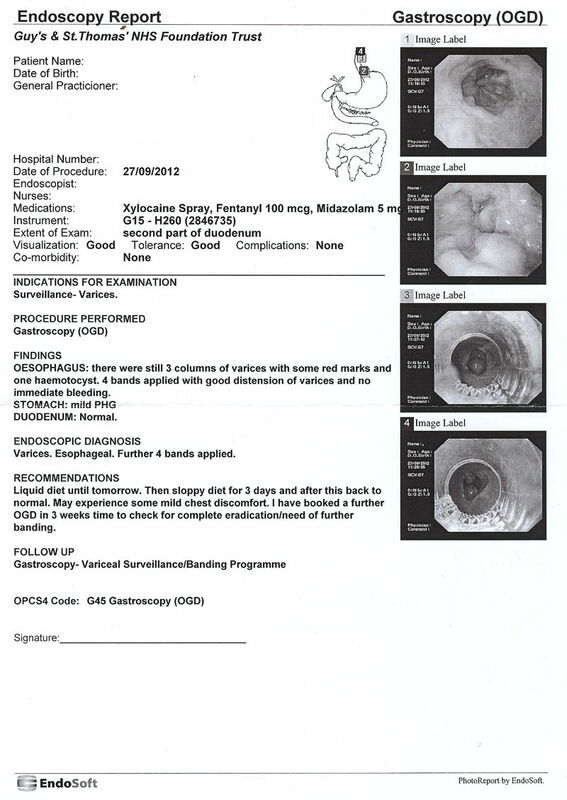 Unfortunately the image capture wasn't working properly so the Endoscopy Report is not worth showing. The camera made it all the way to the anastomosis (the rejoin between large and small intestines following the reversal operation in June 2011). So what did we see in glorious living colour on a large screen - NOTHING. Or rather nothing out of the ordinary. 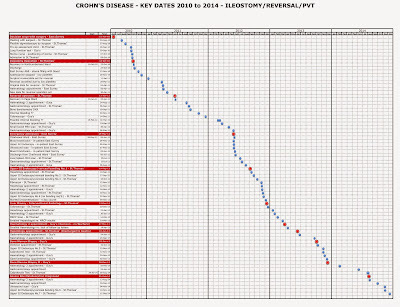 No signs of active Crohn's Disease at all. Nada. De Rien. Nichts. This is the result I was hoping for but didn't really expect. It was really a repeat of the colonoscopy result from a year ago and I've got a Rutgeert's score of i0. Follow up appointment - 6 months time. One reason for requesting this colonoscopy was because I've been getting an ache in the vicinity of the anastomosis. It's clearly not from inside the gut so may well be caused by adhesions. I don't know what the implications are and it's the one question I forgot to ask. My last CT scan took place before I started this blog in earnest so I don't have a full account of what went on. It is, however, a very significant test in my history of Crohn's and is the procedure that confirmed surgery was inevitable. I can remember I was desperate to have the scan as I knew things were going very wrong internally. Rather than just book an appointment I explained my predicament to the appointments clerk and said that I could be available at fairly short notice should a cancellation arise. It worked and I was seen within a few days. I don't remember much about the actual procedure apart from sitting in the waiting room having been told to arrive an hour early to drink some liquid. The liquid turned out to be water and I was presented with a litre jug and a glass. I wasn't sure how I would get through it all so decided to set myself a target of downing a glass every so many minutes. It was a good plan until a very apologetic nurse appeared with a second litre jug and said I should have given you this one to drink as well. Daunting. When I went for my next outpatient's appointment in June the radiologist's report was not available. The scan itself was on the system so my consultant opened up the file and we watched it on his computer screen. The first thing that struck me were the large areas of solid black that appeared. To my untrained eye they looked serious and I wondered if they represented growths in my abdomen. Luckily they were just air pockets which show up as black voids. It wasn't until that next appointment in early August that I was told the CT report was now available. The delay was because of the complicated picture with both ileal disease and the suspicion that I was fistulating from there into other parts of the small bowel, possibly the sigmoid. The suggestion was that I may have a localised perforation "with no definitive collection". My consultant put it in layman's terms - "It looks like you've got an octopus in there". Fibroscan of the liver. This is the non-invasive alternative to a needle biopsy. To quote from the unit manufacturer's literature - "a mechanical pulse is generated at the skin surface, which is propagated through the liver. The velocity of the wave is measured by ultrasound. The velocity is directly correlate to the stiffness of the liver, which in turn reflects the degree of fibrosis – the stiffer the liver, the greater the degree of fibrosis." The day of the liver biopsy had finally arrived. I'd covered all the bases so it should all go smoothly. This is a standard procedure that is done every day but for some reason I've found the thought of it quite daunting. Not the actual procedure itself (although this is what Patient.co.uk says on the matter - "Although liver biopsy may be an essential part of patient management, it is an invasive procedure with a relatively high risk of complications") but, in my case, the variables brought about by the low platelet issue. Start time was set for 9:30 at St.Thomas' and the letter said be there 30 minutes early to get prepped. I'm not allowed to drive for 48 hours after the procedure so organised a lift down to the station. I also needed to be escorted on the journey home so my long suffering wife accompanied me. We had an early start. It must have been the coldest night of the winter so far, minus six. So down to Redhill for the train just before 8:00. Now I know why I commute earlier than this. The train was stuffed full, no seats free. We arrived at St.Thomas' well before 9:00 and made our way into the warren called Interventional Radiology. I booked in with one of the nurses and we were shown to a waiting room. The nurse came back with the consent form to start filling out and then disappeared. About ten minutes later I thought I heard my name mentioned together with "Where is he? They've been looking for him for 20 minutes". A little bit disconcerting. We sat tight and the administrator appeared and said "Your platelets are very low and they are concerned about the procedure. You were expected in last night to get prepared. Did anyone call you? They're going to try and ring you on your mobile". I checked my mobile but hadn't missed any calls. At this point I could see the wheels coming off the wagon. Luckily I had brought with me a copy of the email trail which explained who I had spoken to and what I had done to make everything, supposedly, go smoothly. I explained all this to the administrator. She disappeared for a while and then returned to say that they were waiting for a call from one of the doctors to see how they wanted to proceed. By now we were approaching 9:30 so I could see my "slot" disappearing. First, local anesthetic was injected around the area. The biopsy needle was then slowly introduced through the skin, guided by the ultrasound scan. 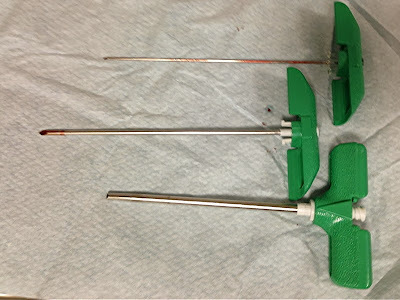 There was one point which sent a short, sharp pain through my lower abdomen and that's when the needle passed through the outer membrane of the liver. I was expecting the needle to go straight in, take a sample, and then quickly withdrawn but the process actually takes a lot longer as it is slowly guided into position. Every so often I was getting another sharp pain in my shoulder. I've learned not to "be brave", and keep quiet, as the pain may indicate a problem. I told the doctor what was happening and she adjusted the needle position accordingly. I don't know exactly how long the whole thing took, probably 50 minutes all up. It was quite a relief to hear the words "All finished". Once the two hours were up I was allowed to roll onto my back and sit up. I was presented with an NHS Snack Box - sandwiches, crisps, yogurt, fruit juice and a chocolate biscuit. Never seen one of those before. I had some questions, mainly to do with what to look out for that would indicate if something was going wrong. The nurse patiently explained the potential signs of trouble and answered my more general questions. I'm full of admiration for Interventional Radiology at St.Thomas'. Apart from the small hiccup at the start (which was nothing to do with them) everything ran very smoothly. The nurses were fantastic. Nothing was too much trouble. They kept me informed at every stage along the way and answered all my questions with patience and good humour. 10 out of 10. My last task will be to ring them in the morning to let them know if I'm OK. I never got to the bottom of "we were expecting him in last night". Will ask my lead consultant when I see him for the final planned test for 2012 - a colonoscopy next Thursday. An 8:30 start for that one but hopefully don't need to be accompanied. I hadn't had an MRI scan before so wasn't sure what to expect. The main thing I'd been told was that some patients found the whole process claustrophobic. Because the scan was concentrating on the digestive system I wasn't allowed to eat for the 8 hours prior to the test and was asked to arrive 1 hour early to drink a "special fluid". This fluid looked very much like wallpaper paste but was lemon flavoured. There was a litre to drink and as I got closer to the bottom of the jug the consistency felt like wallpaper paste. Next time I have to drink MRI prep I'll make sure I keep stirring it throughout. When it had had time to move into my system I was taken into the scanner room. You're confronted with a large, ring doughnut shaped bit of kit with a trolley that slides in and out. I was asked to lie face down on the trolley with my arms above my head. Not the most comfortable position when you've just drunk a litre of liquid. The radiographer explains what to expect and tells you that at various points within the test process you will be asked to hold your breath. Didn't sound like a problem but you have to exhale first and that makes it a lot more difficult. You are given a set of headphones to wear as the machine is "quite noisy". At least I didn't get claustrophobia as I went into the "tunnel" feet first. She wasn't kidding about noisy. The best way I can describe it is being caught in the middle of a game of space invaders. The machine makes some very loud sounds and then, towards the end of the first test session, the table you are lying on starts to vibrate. A very strange feeling. The contrast dye is then introduced and the whole test sequence repeated. I'm pleased to say that nothing happened, not even a hint of having to rush off to the loo. In fact the effect of the prep liquid was very short lived. The results weren't available straight away as they had to be interpreted by an MRI radiologist. Would have a three week wait before I saw my usual consultant. The consultant wanted to have a look at my spleen and liver which meant no need for fasting beforehand or having to drink any special fluids. My appointment was at 10:00am and the letter said to be there 15 minutes before that time. I checked in at reception and was given a questionnaire which asked about medication, recent operations and any implants you might have. I filled it in and only waited a few minutes before I was shown to a cubicle and asked to change into a hospital gown. This time I was laying on my back, going into the machine head first. This was a lot more comfortable that the previous scan, in April, where I had to lay on my front with my arms above my head. Once the radiographer is happy you are in the correct position the scanning sequence starts and they give you instructions via the headphones. The main instruction is to breathe in and then half breathe out and hold your breathe. Because I knew what to expect I found this a lot easier to cope with than before. Some people get claustrophobic in the scanner but I suppose it depends on the size and length of the tunnel of a particular machine. I had no problems with this. The tunnel was relatively short and you could always see out both sides. The whole procedure lasted about twenty minutes and was slightly less noisy that the St.Thomas' machine. Halfway through the radiographer said they were now going to inject the marker dye into my arm. Usually you can feel this cold liquid coursing through your veins but this dye must have been at room temperature as I never felt a thing. The radiographers can see the results in their control room so that they can make sure they are capturing the images required but the actual interpretation and report is put together by the radiologist and takes around 7 to 10 working days. I have an appointment with my consultant on Monday week (16th July) so they should be ready for that. A simple procedure for measuring bile acid malabsorption. It involved a trip to St.Thomas' Nuclear Medecine Dept. to swallow a radioactive pill and then return three hours later for scans - 5mins lying on back and then repeat lying on front. Then a further visit, one week later, for follow-up scans. The system then compares the two and works out how much of the radio active tracer has remained in the system and from that the bile acid absorption. Off to St.Thomas' Hospital, this time for an endoscopy......at least that's what I thought. Of all the tests I've had I find endoscopies the worst to deal with and would always choose to be sedated. 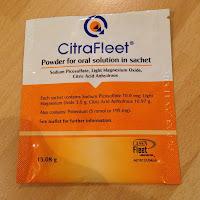 The implication of sedation is not being able to drive for 24 hours afterwards and I really needed the car the next day so I took the decision before I went in that I would only have the throat numbing spray and nothing else. We had quite a long wait before I was taken into the treatment area. The problem was that the earlier patients were taking longer to come round after their procedures and there were no spaces in the recovery area. Eventually it was my turn. She went through the risks associated with the procedure and got me to sign the consent form. I then had a cannula inserted in the back of my hand and I was ready for the procedure. After a few minutes I was wheeled into the testing room, had a couple of squirts of throat numbing spray (xylocaine - tastes of burnt bananas) and then the sedative was injected into the cannula. Next thing I knew I was lying in Recovery. 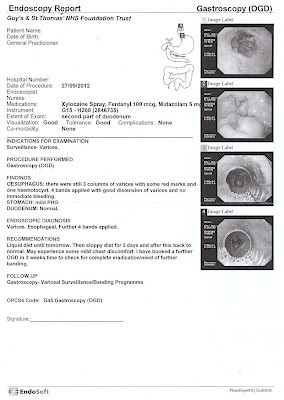 When I had woken up sufficiently I was given a copy of the endoscopy report that would be sent to my GP. The doctor had found three large varices with high risk stigmata and had applied 6 bands to them. The nurse told me that I must only have liquids for the next 24 hours and then three days of "sloppy" food. Now maybe it's a man thing, but the sandwiches I had brought with me looked very appetising, so I waited a while and then tucked in, ignoring the nurse's advice. Maybe stupidity is a better description because it did hurt swallowing and I know not to do it again. When we got back from London I did the second stupid thing - got in the car and drove home from the station. It was only afterwards that I read the leaflet I had been given at the hospital that pointed out that your insurance is invalid during the 24 hours following sedation. I won't do that again. That night I was aware that I was losing a little blood, which I suppose was only to be expected, but it did lead to a sleepless night worrying about whether we should still go out to all the places we had planned for the rest of the week. In the end I came back to the "I will not let Crohn's rule my life" attitude and decided we should go whatever. I've learned my lesson from the last session - no driving home after this one so my sister picked us up and took us to the station. We arrived nice and early at St.Thomas' and knew exactly where to go to get booked in with endoscopy reception. Five minutes later I was called in by one of the nurses to go through "when was the last think you ate anything? ","have you got an allergies?" routine. She then went off to find out how long I would be waiting before the procedure took place. She came back with the good news that there was only one patient in front of me so I could go and get my cannula fitted. I said goodbye to my wife and said I'd be ready for collection in a couple of hours. It was certainly a lot quieter on a Thursday. I was led to a small cubicle, took my shoes off and laid on the bed. At least with an endoscopy there's no need to get changed into a surgical gown. Another nurse then put a cannula into my right arm, checked my blood pressure and heart rate and I then waited to be seen by the doctor. In a while the doctor appeared and I recognised her as the one who had carried out the previous banding. She asked how I'd been feeling since the last one and if I had any questions. The one thing I did want to know is why you are only allowed liquids after the banding. I wanted to know if it was purely because it would hurt or if there was a medical reason. She explained that the rubber bands placed around the varices might become dislodged so it was liquids only for the first 24 hours and then 3 days of sloppy diet. I replied that this time I would keep to this advice to which she gave me an "old fashioned" look! She explained that they would have a look and see how the previous banding had gone and then carry out any more that might be needed. She would book me in for a third session in another 3 weeks time. I was then wheeled into the procedure room and connected up to another blood pressure monitor and an oxygen supply. Then it was the xylocaine (burnt banana flavoured) spray that numbs the back of your throat, and finally a sort of gag is placed between you teeth and this helps to guide the endoscope. It's the gag that I really don't like so I was pleased that the doctor injected the sedative straight away with the words "you're going to feel a little drowsy". The procedure started at 11:15 and the last image from the endoscopy report shows 11:29 so the whole thing took around 15 minutes. The next thing I was aware of was waking up in the recovery area and it was all over for another three weeks. I was given a copy of the printout from today's session and about one o'clock I was allowed to leave. Compared with last time I was in quite a bit more discomfort and was slightly wobbly on my feet. 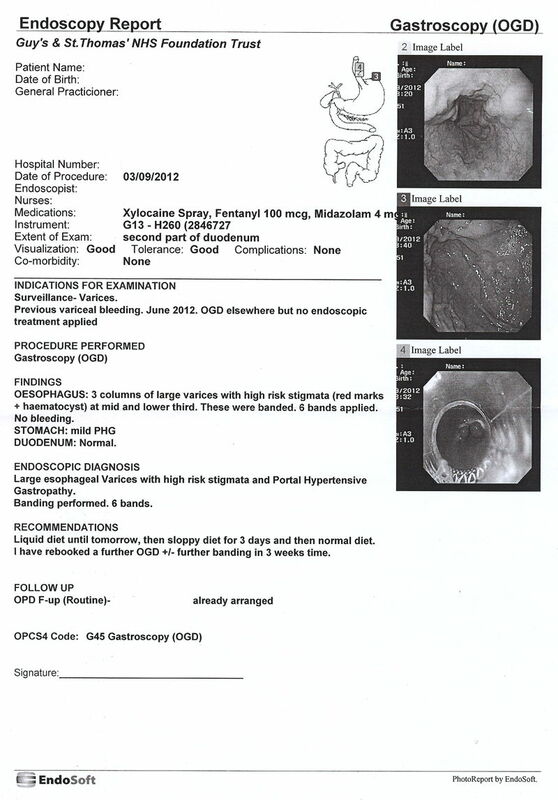 Here's today's endoscopy report. I haven't actually discussed the images with anyone but I think that Image 1 shows the varices down towards the stomach. Images 3 and 4 show the new bands in place. Before leaving the hospital I called into the Endoscopy Appointments room and asked if I could get a date for Obliteration 3. The doctor had already requested the appointment so I was able to choose a date for 3 weeks time. Given that today's clinic seemed very quiet I chose another Thursday and it has the added advantage of still being able to go to work for the first 3 days of the week and then spend a long weekend recovering. That evening I was in quite a lot of discomfort and took a couple of doses of Paracetamol. It was certainly a lot more painful than before but I noticed that the report for this session actually says "May experience some mild chest discomfort" so I'll grin and bear it. 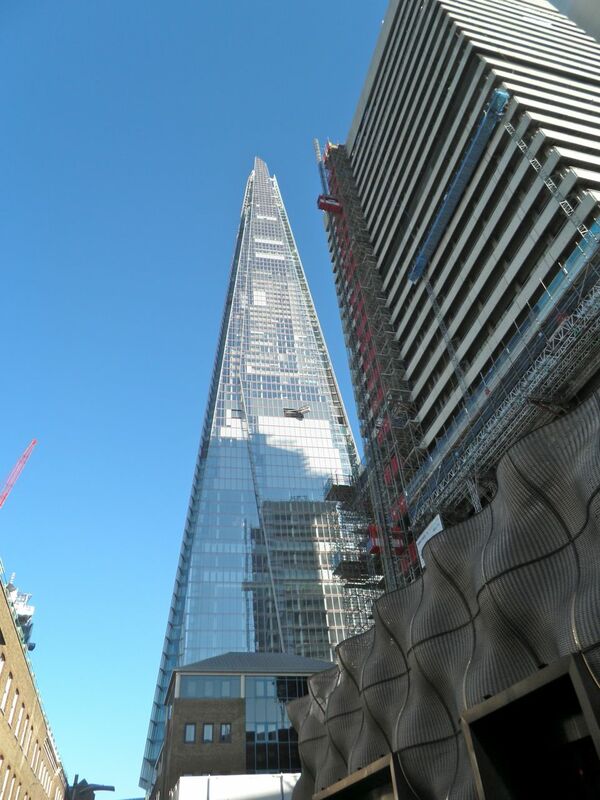 Friday 28th September 2012 - Have just finished writing up yesterday's events on this post. I'm finding each time I think about the burnt banana spray and the mouth gag I'm getting a slightly sick feeling in my stomach and at the back of my throat. I need to address this now so that I'm over it in time for the next banding. I surprise myself how laid back I am about hospitals, procedures and appointments so I don't want to spoil that for the next one.